How long have you been involved with Bellydance? I started taking classes in American Cabaret style in 2000. By 2004, I hit a plateau creatively, and tribal came along (to New York City) in a really big way. I loved it and felt it was much more “me”. By 2005, I had a dance partner, Joanne, and we began Serpentina as a duet. After moving to Toronto, I hit the ground running and began my troupe, The Serpentina North Ensemble in December 2007. The rest is history! How did your interest in it begin? I knew I needed to do something active; I was spending way too much time in front of a computer. I was taken to the gym and hated it. I took up ballet classes and found it to be an exercise in humiliation. Even in an adult beginner ballet class, there were serious students enrolled who were dancing every day and I felt like the comic relief. 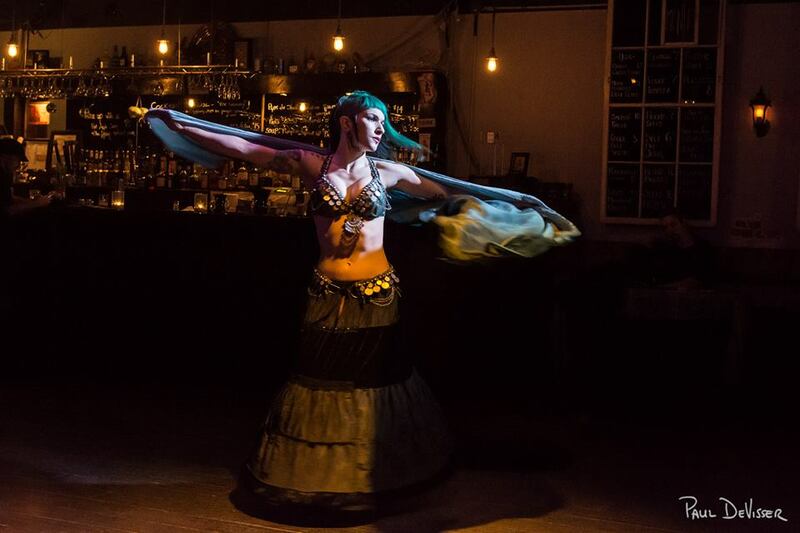 Then one day a friend suggested “bellydance?” and I decided to give it a try. It was love at first shimmy. The music was cool, the costumes were cool, and it made me feel good. How do you develop new routines? The majority of what I do is actually group improv, so our troupe performances are never the same. When I do create choreography, it usually starts with a song and a style and feeling I want to pursue. What inspires your personal dance work? A lot of it comes from music. Something in a song will spark an idea, or a certain sound seems to call for a specific move, and then that turns into combinations and choreography. Music with a dark and moody edge really grabs me. Currently, I’m listening to a lot of Love and Rockets and I really like Daniel Ash’s latest work. How would someone who is completely new to dance classes get involved with tribal bellydance? A newbie should just go to class and give it a try. I think there’s a lot of hesitation or fear of feeling awkward in front of other people, but everyone has to start some where. It’s okay to make mistakes or not “get” something straight away. Once a student can cross that mental barrier, classes are really fun. Progress comes with time. Why do you think it appeals so much to the Gothic scene? I think a lot of fusion style bellydance resonates with a lot of Dead Can Dance listeners. For example, a song like The Ubiquitous Mr. Lovegrove just calls for serpentine movement and slow, fluid circles through the body. It’s so slinky and sensuous and can hold that attitude of “I know something you don’t”. What appeals to you most about dance as a practice? There are so many reasons. It’s a creative outlet as well as a release from the mundane. It’s a facet of my personality. It makes me feel expressive and alive. Are there other forms of dance that influence your work and routines? Definitely! I’ve been studying kathak for nearly 8 years, and it definitely informs a lot of my work. Overall, I’ve very active and want to condition myself for strength and stamina as well as artistry. I frequently drop in to other classes and attend workshops, too. At the end of March, I’m off to Seattle for the fourth year to attend Cues & Tattoos. What has been your favorite public performance so far? I’m really pleased with our show at TedX York. It’s such a fun choreography, and it looked great! I also really loved dancing at an Armenian wedding. Although my dancing was probably just okay, the audience ate it up and just roared. It was such a great feeling. What has been the most challenging one? Putting together a half an hour set for The Ex (Canadian National Exhibition) was tough. I was so stressed and nervous, especially because I had just met my (now) significant other, and he was coming to see me dance with my troupe. Other big challenges have been choreographies that get finished at the eleventh hour and the whole troupe gets stressed. We’ve had a couple tough love moments! Getting nervous/excited is a good thing, though. It means you care about the work and you want to present it in the best way possible. What’s your next goal with dance? I just want to keep growing as a dancer. I keep practicing, studying with various people, and planning goals for myself — like drilling moves into my muscle memory so they can be executed as crisply as possible. Are you planning anything for the rest of 2015 we should know about? We are definitely working out a full length show, and I’m hoping to grow our student base. We have an open jam on March 26 and the start of the spring series on April 2. Where can we see you and your troupes perform this year? Nothing’s currently scheduled/set in stone, which is nice in that the troupe gets time to work on things, and topolish and refine. As the weather gets warmer, it’ll get fairly busy!